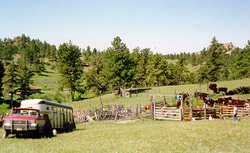 For a unique experience, our family invites you to share in the pleasures and challenges of cattle ranching. We offer our guests the opportunity to interact with nature in the most spectacular of terrains. Let your adventure begin each day by waking up under the big sky of Southeastern Montana to the sounds of Meadow Larks singing. An abundance of wildlife and a wide variety of outdoor activities are sure to keep your camera in focus. Hay meadows, wooded river bottoms, and pine tree topped hills add to the splendor. Hiking provides an unique opportunity to view the land up close. A 'Kodak' moment awaits guests each day. After a day on the range, return to the quiet comfort of your cabin for an evening of rest, relaxation, and breathtaking Montana sunsets. Accommodations includes a clean, comfortable, rustic log cabin in a quiet, country atmosphere with modern furnishings, all linens and cooking utensils provided. Accommodates 4 to 6 people. Directions: Located 65 miles north of Gillette Wyoming on Highway 59 North go to the 14 mile marker, turn right to Little Bear Skull Guest Ranch. Or, by traveling 200 miles southeast of Billings, Montana along Highway 212 east to Broadus. 3 miles more on Highway 212 to Highway 59 South. Turn right and proceed to the 14 mile marker and Little Bear Skull Guest Ranch is on the left.